Bronte draws origin from a group of farmhouses (the ones unified by Carlo V order in 1535 were 24) populated by poor farmers and she­pherds, always oppressed, object of abuses of every kind and perennially struggling for their existence. That is why his inhabitants preserved a strongly determinate nature, libertarian and seldom available to compromise, conscious and jealous of their rights, that, if required, can be claimed and get respected. Maybe not by chance the first man to talk about man's rights in Italy the philosopher Nicola Spedalieri, native of Bronte that was writing: "the more oppressed they are, the more they estimate themselves; and, the more they estimate, livelier is felt the wish for revenge". And of violated rights the brontese people had quite a lot. Fights also against the tax collectors of Randazzo, which was retaining certain rights, with relative income, deriving from the ancient "mere and mixed empire". The opponent against whom to fight was often changing but the condition of vasallage and poverty of the brontese farmers was never changing. It is not by chance therefore that the brontese were also protagonists in good part of the Sicilian riots wanting to affirm the principles of autonomy and independence: from the rebellion against the Bourbon government of 1820, together with Palermo, that wished the restoration of the Sicilian constitution of 1812, to the risings of 1848-1849 (the year of the aborted revolutions for Italy) and, at last, to those of 1860 (more sadly famous) that obtained for Bronte the defamatory charge of "injured humanity", as hastily was declaring Nino Bixio, responsible creator of a massacre which choked in blood the yearning for freedom wished for centuries. Besides the famines, the malaria, plagues of every kind, Etna and the thieves which were infesting the countryside, the brontese folks, true vassals, were forced to submit also to several vexations and above all to the gabelle, imposed with strength from the various succeeding masters through the centuries. del salame "consiste pagarsi tarì tre per ogni barile d'ogni cosa salata, tarì sei per ogni carico di pescame e tarì uno per ogni cantaro di formag­gio, et tarì uno per ogni rotolo d'oglio ed altre minuzzerie"
della carne "consiste che si paga grana 2 per ogni rotolo"
della panetteria "consiste in zagato di non potere fare pane, nè altra cosa di pasta cotta nessuna persona senonchè li gabelloti e suoi sugabelloti con aggregazione di grana 10 per tùmino di formento"
del maldenaro "consiste di pagarsi tarì uno per salma, così del frumento che dell'orzo, ed altri ligumi, tarì uno per onza del bestiame che si bende, ed ogni altra cosa, così commestibile, come potabile, e dell'estrazione di ogni cosa, et uno per ogni libra di seta". The tax was called "maldenaro" because hated by everyone. The icy snow that the Bronte people took in the summer from the slopes of Etna was also taxed and brought to Bronte "per ogni rotolo di neve, grana due"(for each roll of snow, two grain). del formaggio "consiste di aversi a pagare per ogni persona che vende formaggio fuori il terriere tarì tre per cantaro (80 Kg.) e tarì uno grana dieci per ogni cantaro di ricotta"
della caccia "consiste di non potersi uscire nessuna sorte di caccia; aggregata a detta tabella tarì uno per ogni carico di pera s'estrae"
della fogliame "consiste d'avere a pagare d'ogni sorta d'ortaggio grana due per tarì"
del mortigio or mortizzi or primigie, imposed since 1616 on every family. It was levied directly by the City "to save the priest some repellent some wood". Even when he died there was no peace, death was taxed: the gabelle, in fact, was nothing but a forced contribution to the clergy for the burial of corpses and the accompaniment "vestiti di cotta" (clothes of crush) to the cemetery: "yes he paid tarì three for each fire, to have the right, after death, to be associated with the church "(only in April 1880 the City began to build the Cemetery). The Gabella, hated by the people of Bronte, although abolished by King Ferdinand in 1781, continued to be levied for almost the entire 18th century. Further to these, to better milk and shear the poor shepherds and peasants of Bronte, the fine minds of the fiscal officers had invented the tax on the plough (“five tari’ for every plough or perch”), that on the charcoal or fire wood, the customs duty (for imported goods), the exit duty ( for exported goods), the tax on the Zagato (monopoly rights to be able to sell cheeses, salami, oil or bread). On good holding (some sort of duty on the patrimony) and also the Collections, originally extraordinary taxes to be collected only in few cases (matrimonies of daughters or sisters of the king, coronations, invasions) but soon changed in ordinary taxes (were collected practi­cally every year). In the end, not having anything more to tax, the salaries were forcibly reduced and eliminated expenses for public works. The poor Council, then, in addition to the "alms" that is to the contributions in cash and various kinds (meat, wheat, wood, coal) granted to the convents of the town on the occasion of feasts and religious celebrations, had to pay also «lo scasciato» (o scascio): a contribution paid to priests, clerics and deacons deemed by law to be privileged persons, not subject to paying taxes. And there were so many: think that in 1681 there were 47 priests, 5 deacons and 27 clerics on a population that did not exceed ten thousand. "The table of accounts of 1681/82 - writes Vincenzo Pappalardo - shows how, with the "sscasciato" and alms, 13.9% of the municipal income was the prerogative of the clergy" (A feudal destiny in La Ducea di Bronte di A. Nelson Hood, Bronte, 2005). In the month of July of 1820 in Nola a military insurrection burst out and widened from country to country to reach even Bronte, that had remained then to the margins to look. Ferdinand I° of the Two Sicily, pushed by the events, granted the Constitution Of Spain. In Palermo, the governor promised that also in Sicily, as part of the kingdom, there would be some political concessions. To the praise of the few joined hostile shouts, waving tricolor cockades and yellow ribbons, this last symbol of the autonomy. The eastern Sicily was accepting the liberal constitution already in place to Naples and was therefore lining up against Palermo that, wishing to monopolize the political power, because forgotten by the Government In Naples, was shouting for autonomy and independence, invoking also the English inspired Sicilian constitution of 1812. Bronte depended to Catania (supportive of Naples) and to the near Adernò, center of military operations of the Principe della Catena, from whom were arriving continuous threats. In Bronte the "baronelli" (the feudatories) were faithful to the Bourbon as was also the clergy, which was holding finance and culture. That applies also to the "ducal ones", since they were managing and conditioning the Town Council. The mayor Gioacchino Spedalieri, was trying neutrality while playing for time, receiving emissaries both from Palermo and from Catania, now with tricolor and yellow bands, now with bands of other colors. Between the brontese mass was winding a certain hope and freedom anxiety above all the wish to shake off the yoke of restriction and poverty caused, on their skin, by the "ducal authorities", with feudal methods. From Catania were sent Government forces which took position on the hill San Marco and began to go all over the countryside and up to the periphery of the town. They committed sacks, continuous raids and violences of every kind: many brontese chaps were imprisonned, men and women; one of the women who got killed was pregnant, and two ten years old girls were raped and one of them died. «Era scura la notte, e catellon catelloni popolani e campa­gnoli si appressarono al campo ne­mico, e si postarono dietro muriccioli a tiro di fucili. L'alba non era fatta, micidiali rimbombi e la cu­pa luce della scarica dei fucili destavano l’attenzione ed il timore, proprii del caso. Io ero stato dai miei condotto in un pal­men­to del Corvo, e palpitante scappai a guarda­re. I regi governativi, circondati da più parti, si sbandarono nelle vicine sciare: «…infelici non potevano correre, raggiunti dai vitto­rio­si, cor­renti come daini, erano trucidati». Soon after noon everything was over. In the end the brontese people, exasperated, armed themselves and started to protest, shouting "long live Palermo!, Long live Santa Rosalia! ", and raised the Palermo flag. The fight was violent and bloody, however the Bourbon were forced to retreat with heavy losses. With the arrival of the General Pepe and the capitulation of Palermo on (October 5) also Bronte waved white flag. The 29 of the same month the representatives of the Council swore for the Constitution Of Naples, even if with the intent to repudiate their oath as soon as possible. Pious IX, became a pope in June of 1846, and, as first liberality act, granted the amnesty to the condemned politicians. Such a gesture wrong footed princes and dukes of the various states which were forced, in some way, to release the brakes of the absolutism and grant reforms, (except for withdrawing them later). Ferdinand II remained deaf and obstinate to the reforms and freedoms, (of the press, of opinion and of speech), that "the loved population" was requiring, In January of 1848 Palermo rose in arms and so did, subsequently, Catania, Messina and Agrigento. Meantime, with a deliberation of the April of the same year, the Sicilian Parliament was declaring expired the Bourbon king Ferdinand II and his dynasty. Such ideas of freedom and of independence were getting also to the small centers and so also Bronte was praising the liberal Pope, the constitution and a committee, formed by thirty people, chaired by Vincenzo Meli, was formed at the same time. Inexperienced and timorous, the Meli, asked instructions to Marletta, president of the Committee Of Catania, that was recommending to him the public order, the respect of people and of property and that every adverse act would have been severely punished. For the brontese people, the freedom wave meant: abolition of the tax on milling, rebellion to the Bourbon (identified in the "ducal ones") authorities, division of the land and also the excuse to bring ancient grudges to light. On April 23, to the sound of bells, the riotous people assembled and gone to Maniace invaded the Dukedom to obtain the division of vineyards and other land among the farmers. There were some shots and woundings but blood was not shed, since the "ducal ones" disappeared and and the damages were to thefts and wrecking of stores. Then everyone went back happy and glad to own a little bit of soil. 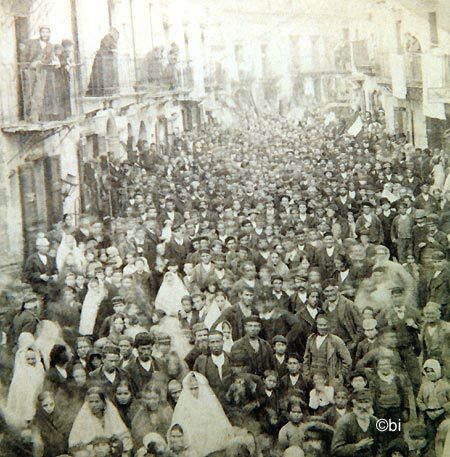 An ancient, very rare, photography of Bronte's people para­ding in the Corso Umberto. It was taken in 1892 when came to Bronte a Committee for the election to Montecitorio of the brontese Deputy Fran­cesco Cimbali. The English governor of the Dukedom sent protests to the Vice-consul G. Rose and from these to the president of the Catania' Committee. Obviously followed a legal recourse by the Duke and a prosecution begun, against those who had occupied the land, and dragged itself for quite a long time. 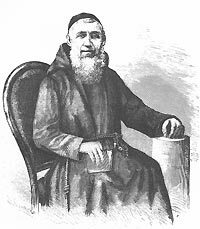 Finally, thanks to the clever work performed by the abbot Castiglione, who was representing the Council Of Bronte to the Sicilian Parliament, on September 18 of 1848 was decided that any proceeding and criminal prosecution for what had happened were to be abolished. The positive result of the dispute for the brontese people (the communists) was reason of festivity and of big regret for the ducal ones. The tension among the two groups remained very high. Ferdinand II, in the meantime was sending a large fleet at the command of the General Filangieri and was regaining Sicily, restoring the Neapolitan absolutism. It was clearly a return, once more, to the old status quo ante, but, writes the De Luca "there remained buried a big fire, that in 1860 blazed most horribly ". With regard to the restoration of 1849 was born the saying "càlati jùncu ca passa la china" ("stoop down reed until the flood passes away").